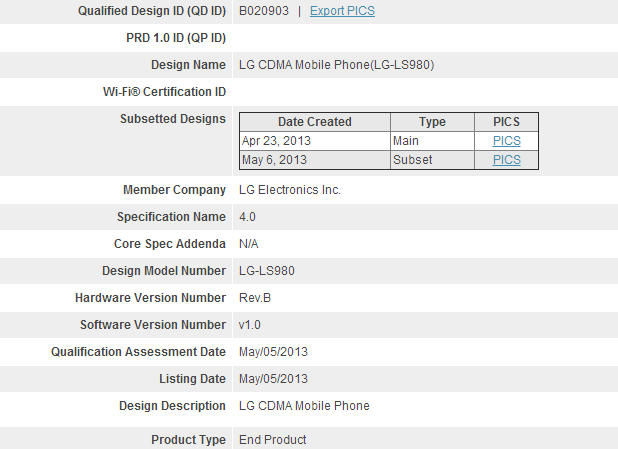 [Updated] Bluetooth Filing Reveals LG LS980 Running Android 4.2 - Is This The Snapdragon 800-Powered Sprint Optimus G 2? Update: Turns out this probably isn't the Optimus G Pro - it looks a heck of a lot more like what is being collectively dubbed the Optimus G 2. It seems an official Sprint page with build.prop info for the LS980 has been dug up (by our commenters), and it reveals a few tasty tidbits -namely, confirming Android 4.2[.2], and an MSM8974 chipset. That's no Snapdragon 600 - that's a Snapdragon 800. That processor isn't even out yet, so whatever phone this is, it's still a ways off. Our guess is the successor to the Optimus G.
While Bluetooth organization filings aren't always the most reliable way to identify a particular upcoming device, we're fairly confident in a filing that was made yesterday for a certain piece of LG hardware: the LS980. We're pretty sure this is a Sprint version of the Optimus G Pro. At least, everything we can tease out indicates as much - allow me to explain. First, "LS" is the device prefix LG uses for all of its Sprint phones (it probably stands for LG / Sprint), so this is really the most concrete detail we can edge out of the filing. How do we get to this being an Optimus G Pro, though? Well, that requires a little bit of inference. The AT&T version of the Optimus G Pro has the model number E-980. I think you can figure out where the logic goes from there. In all likelihood, this is Sprint's Optimus G Pro, at least as far as the model names of the phones are telling us. There is one slightly interesting difference, though, between the two devices. The Bluetooth org's website also allows you to dig into the underlying Bluetooth firmware ("stack") layer that's running on the filed device. 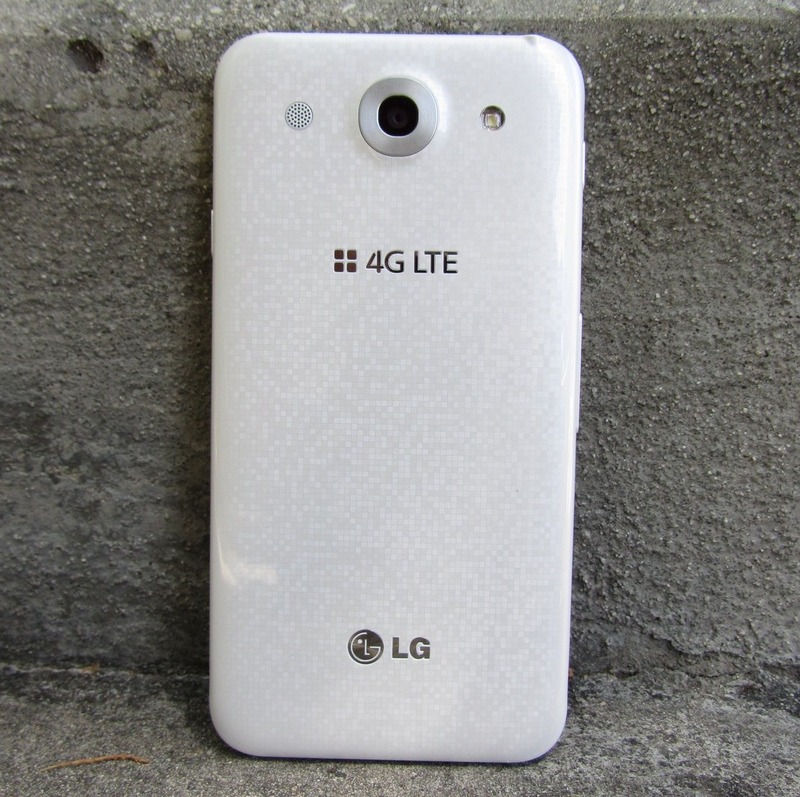 AT&T's Optimus G Pro is listed as running BTL-A5.0, a software that is described as "replacing the BlueZ offering provided in Google's Android operating system." The hitch here is that Google ditched BlueZ when Android 4.2 was released, and instead chose a Broadcom-based solution. Yes, the one that's been giving you so much trouble and basically ruined Bluetooth audio on a number of 4.2 devices. Regardless, if you dig into the LS980's filing info, you find very different Bluetooth firmware information: Broadcom's AirForceBT 1.0, which "utilizes the core Bluetooth protocol stack from the Google Android 4.2 operating system." That means this Bluetooth software layer requires components built into Android 4.2 (and above). It's a pretty solid conclusion, then, that this device is running Android 4.2 (well, at least 4.2, but probably 4.2). So, to summarize - it looks like Sprint is getting the Optimus G Pro, and it very much looks like it's going to ship with Android 4.2. Now, it's possible LG has merely chosen this model number for a new high-end Sprint device by coincidence, too. It could be an Optimus G 2, or even a Sprint Nexus 4, but for the time being, our money's definitely on the G Pro. Still, it's a bit odd that Sprint didn't announce that it's getting on board as a carrier partner when AT&T did. I'm sure we'll be learning more about the LS980 in the coming months.